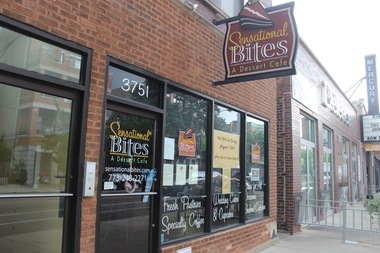 After Sensational Bites closed in August, the owner of Cafe Tola announced she will be opening a second restaurant in its place, 3751 N. Southport Ave.
SOUTHPORT CORRIDOR — An empanada-and-espresso cafe known for its colorful murals is expanding to a second location nearby. The owner of Cafe Tola, 3612 N. Southport Ave., will open Doña Tola Loncheria in early 2016 in the former Sensational Bites down the street, she told DNAinfo Chicago on Friday. The news was first reported by the Southport Corridor blog on Twitter. The 3751 N. Southport Ave. location is fairly small — 1,200 square feet — but coming from a cafe with no seating but for a few tables on a summer sidewalk patio, the new space has endless possibilities, said owner Victoria Salamanca. "We've had serious growing problems from the moment we opened. The neighborhood has always wanted more food and something bigger," she said of Cafe Tola. It will take four or five months before Doña Tola is ready to open, Salamanca said. The restaurant will specalize in Latin comfort food, like braised pork with cactus, spicy red pork in fresh tortillas, breaded steak and rice and beans. Salamanca's recipes come from family — specifically, her namesake and grandmother. Both nicknamed Tola, they were known in their family circle as Doña Tola and Mini Tola. "She's coming in October, and she doesn't even know yet the restaurant that she inspired is going to be named after her," Salamanca said. "She's such an awesome, tough lady, and she's a really great cook," she added. Unlike Cafe Tola, the new restaurant will not serve empanadas. While wildly popular — the cafe sells up to 14,000 empanadas in a single month — empanadas weren't even in Salamanca's original plans when she opened the cafe in 2012, and "it wasn't something we were expecting to take off like it did," she said. Salamanca said she's not worried about competition between the two restaurants, believing that each will serve its own purpose on the Southport Corridor. "I've never experienced a more loving neighborhood. In everything we put out, they let us use our creativeness to inspire their daily lives. It feels really good," she said.